Aboriginal artist Nellie Marks Nakamarra is the younger sister of the renowned Central Australian artist Elizabeth Marks Nakamarra. Growing up with the same artistic influences they share a similar style and many of the same dreamings. Nellie was taught to paint by many of the founders of the desert art movement. Born in Kintore and growing up in the Western Desert Nellie’s greatest artistic influences included Turkey Tolson, Uta Uta and many others. Her subjects are primarily Lightening Dreaming, Women’s stories and Women’s Tingari. Nellie today resides primarily at Kintore but alternates travels between Kintore, Tjukulla and Kiwirrkurra. This painting shows Nellie’s depiction of “Travelling Women” and her country at Kintore approximately 530km west of Alice Springs in Central Australia. The painting was passed to Nellie by her mother, a Warlpiri woman. It shows the Warlpiri and Luritja women as they travel through their country looking for water. 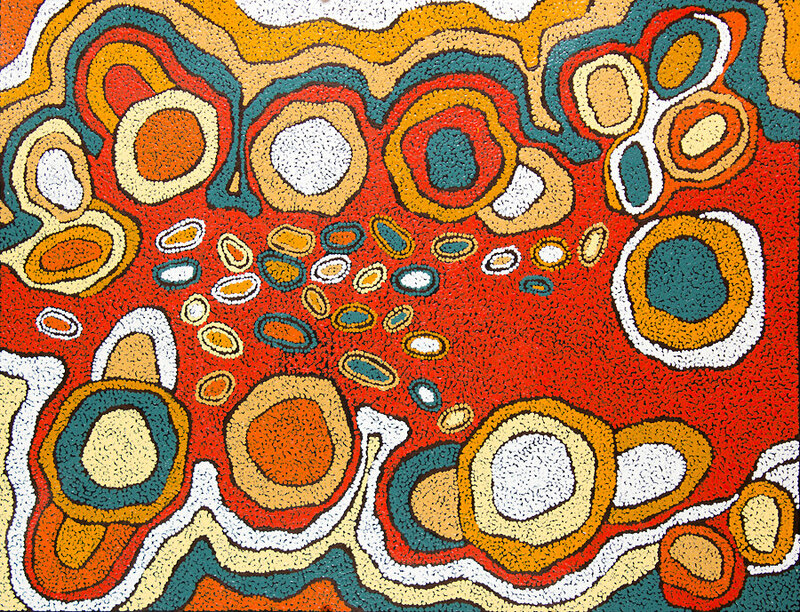 The circles in the middle of the painting represent the rock pools (Puli), the site of water. The iconography surrounding the rock pools are the sandhills (Tali) that the women must travel over to reach the water.